Cambodian Lok Lak is a favorite around our house. It is a specialty dish many Cambodians eat on holidays and special occasions. It is also served in almost every restaurant that offers Cambodian food. 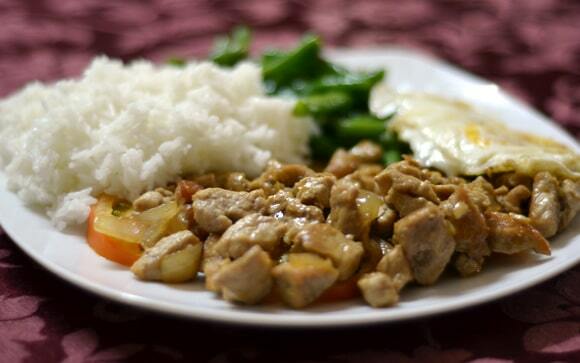 Enjoy this exotic, authentic Asian recipe! In large skillet or wok, cook meat on med-high until half-way done. Add remaining ingredients and bring to a boil. Simmer on low for about 10 minutes. Reserve 1 tbsp. sauce from Lok Lak to use in dipping sauce. On busy days and when I use beef, I place all ingredients in a crockpot and cook on low for 10 hours. Serve on a bed of lettuce and tomatoes(I was out of lettuce in the above pic) with Jasmine rice, stir-fried green beans and lime dipping sauce. Stir all ingredients in small bowl and serve on side of Lok Lak.